This is a healthy dish which, once the ingredients are chopped and sliced, takes very little time to cook. Leftovers, if there are any, are just as good. 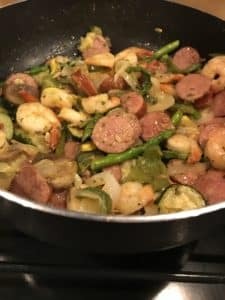 • Cook bell peppers, zucchini, and squash in skillet that you cooked shrimp in with 1 T. olive oil or coconut oil; add onions, garlic and sausage before veggies are cooked and cook along with veggies (onions will burn if added too early). Cook until veggies are soft. • Remove from heat, garnish with parsley and serve hot. Serve with bread for dipping juice. Delicious!